DD5LP/P – July 15th. 2017 – DM/BW-348 Gehrenberg (group activation). This activation was planned in conjunction with a trip to the HAM RADIO event in Friedrichshafen. After the last revision of the list of DM/BW summits, there is now only one practical summit near the HAM RADIO show which is Gehrenberg, a summit I have activated twice before. 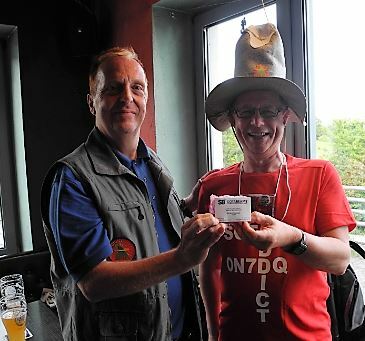 The overall plan came together via the SOTA reflector and it was possible to build a “SOTA Day” for the Saturday of Friedrichshafen. This started with the regular 12 noon meet-up at the QSL wall followed by the afternoon lectures, then came the SOTA group activation and finally I also organised the (very well attended) SOTA dinner in the evening. Equipment packed to support this group activation was my usual SOTA kit. Gehrenberg should be about a 45 minutes drive from the “Neue Messe” in Friedrichshafen, where the HAM RADIO event takes place. I was lucky enough also to find a restaurant for the dinner, not too far from the summit also, so things would not be to bad a drive for all taking part. My in-car GPS is a couple of years old now but has just had new maps added and I was confident from previous outings that I could rely on it bringing me, and my two passengers (Gerard VK2IO and John VK6NU) to the summit without any problems. I was so wrong! The GPS Navi tried to take us first of all up a farm road that simply came to an end (I suspect there “may” have been a small track up to the back of the summit previously but it’s certainly not there now). After resetting our plans and looking at some on-line maps and asking some directions, we ended up at the Gehrenberg look-out tower. This however is NOT on the SOTA summit and hence another back-track was need and eventually, based on my memory of what some of the roads looked like from last time, we arrived at the parking spot about a kilometer from the summit, unpacked and started the walk up the forestry track, only to be passed by two other amateurs in their cars, who said there were no driving restriction signs. I had not checked, there were some signs the year before. In any case upon arrival, one group had gone to the absolute summit, so I decided to set-up in a spot by the radio transmitter tower, that I had used the last two years as I knew was well within the activation zone. This was a good hour and a half after leaving Friedrichshafen, so time was against us, if we were to get to the restaurant on-time. A group of Czech Hams had walked further along the track, to be clear of the other stations. As we were setting up Juerg HB9BIN joined Gerard, John and I and we all shared my dipole antenna. We all managed the required 4 contacts, before pulling all the equipment down and heading back down the hill to the car. Even though the activation was different from what I had planned – I had hoped to have two stations in place before the others arrived and have them simply rotate through to get their 4 contacts for the 8 point summit – it all worked out in the end and it was followed by a lovely evening with good food and chatter at the restaurant for the SOTA dinner, where Luc ON7DQ was awarded the prize of a WSPRLite unit for the most original SOTA clothing. Do not assume the Navi is going to take you to the best access point for a summit, take printed maps as well. I have already been asked if I will run something similar next year. I am considering it, but it would be nice to go to a different summit. That would however need a lot more time, so perhaps I’ll just organise the dinner as I have done, the last two years and leave the activation out of what was quite a busy day. This entry was posted in SOTA and tagged DM/BW-348, Gehrenberg, SOTA by VK2JI DD5LP G8GLM. Bookmark the permalink.